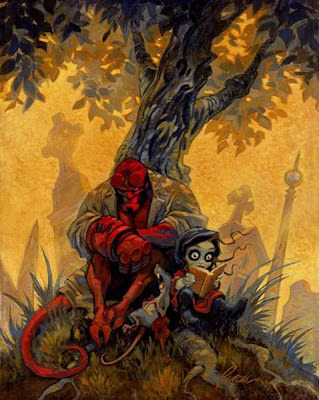 Hell boy you really know how to draw Hellboy especially the facial expression and his hands. Of course Suda looks really sweet and it's interesting, that you put so many crosses on this graveyard. When I go to a graveyard, it's nearly a holy miracle to see a cross next to another. That was supremely unexpected! Looks great though. Interesting to see a "more painterly" type-a thing. Oh WOW that's incredible! That's my favourite so far. I have no idea how you pulled off this kind of colour contrast but you did. I love Suda. Does she and her rat friend have a backstory or anything or a comic you'd like to/are working on? This painting could be my most favorite thing in the history of things. This is awesome Steve...uh, Starchie. Very transporting really. You really got 'in' to the painting there and painted the characters 'in' there...amazing how you achieved this on a 2D surface. They look like they belong together...If she was a couple decades older that is. Awww... They are so cute together! And I really like the painterly technique, tough it is somewhat "illustratey" anyway. I wonder what she's reading...? Mr. Purcell, you've been one of my art heroes since my best friend in 8th grade got me the collected Sam and Max graphic novel. Actually you were a hero before that but I didn't know it when in 6th grade I got monkey island and was absolutely and ridiculously enthralled with the look of the game. I ate up those Lucasarts games like candy and you and Peter Chan shaped my tastes and imagination in deepdish ways. For years I've referred back to the games you worked on and your comic for inspiration. Meeting you at comic-con was awesome and I'll be sure to swing by your booth, buy your stuff and say hi this comic-con as well! Your blog is supremely awesome and ... I think I wanna have yo baby. Please please get this in one of your books! Its suda! Its ernie! Its Hellboy!!!! What supplies do you use when you make a Sam & Max comic, eg paper type and size, inks, etc. I make mini comics myself, and Sam & Max have always been an inspiration- I would be very interested in hearing about your process when making those stories.